North West 200 and Ulster Grand Prix winner Paul Robinson says he is quitting road racing for the sake of his five-year-old son. In an exclusive interview with the News Letter, the County Antrim man said the tragic death of his cousin William Dunlop in a crash at the Skerries 100 in July had convinced him to hang up his leathers for good. Paul Robinson with his son Max after he won the Ultra-Lightweight races at the Ulster Grand Prix in 2017. His father and legendary Armoy Armada member Mervyn was killed at the North West 200 in 1980 when Robinson was only a young boy. Speaking at his home in Ballymoney on Thursday, Robinson said he was no longer prepared to run the risk of leaving his little son Max fatherless and confirmed September’s Irish road racing finale at Killalane near Dublin would be his last appearance between the hedges. “I don’t want him being in a situation where he would be asking what life would have been like if I hadn’t raced. Ballymoney man Paul Robinson leads Christian Elkin at the Ulster Grand Prix last year in the 125/Moto3 class. “I know what it is like because the only real memories I have of my own dad have come from other people – not one of those memories are my own. I do have a few little memories, but nothing really much because I was so young. I don’t want that for Max,” he added. Robinson, though, will still remain involved with motorcycle road racing in 2019 after revealing he intends to run his own team. “I plan to run a wee team of my own and put someone on my bike next year, so that will keep me involved,” he said. Paul Robinson with his cousins Sam (left) and William Dunlop at Walderstown in 2012. Robinson has experienced a few near-misses over the past few seasons and although he averted disaster, he knows only too well things could easily have turned out much worse. “I’ve had a couple of near-misses in the last year or two and thankfully nothing happened out of them, but afterwards you realise that things could have gone horribly wrong,” he said. “It’s not as if we are getting paid thousands to race, so at this stage of my career it’s not worth it for me any more with my wee boy growing up. Former British championship racer winner Paul Robinson was overcome with emotion after winning the last ever 125cc race at the North West 200 in 2010. “It’s not easy for many people in my family when I’m racing, especially my mum and my partner Juliana; it has to be hard on them every weekend. After a long and successful career, he says his victories in the 125 race at the North West 200 in 2010 and a double in the 125/Moto3 races at last year’s Ulster Grand Prix were his proudest moments. “For me, winning at the North West 200 and Ulster Grand Prix stand out for me as the best moments of my career. 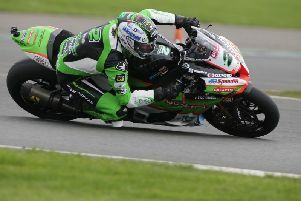 It was nice to win British championship races, but none of those came close to winning at the North West and Ulster,” Robinson said. “At the North West in 2010, William (Dunlop) broke down on the second lap and that left me out on my own. I had so much time to worry if the bike would keep going until the end but it never missed a beat and everyone was waving on the last lap. “It was quite emotional going along the Coast Road and it was the last ever two-stroke race at the North West, which is special too,” he added. He hopes to end his career on a high by clinching the Irish 125/Moto3 championship at Killalane next month after already sewing up the Ulster title on his Moto3 Honda. An experienced competitor, Robinson won 125cc races at British championship level and finished second and third overall in 2000 and 2001.